Organised by the Western Highland Agriculture & Forestry Science Institute (WASI) and Bayer Vietnam, the event attracted hundreds of officials from the plant protection departments of Lâm Đồng, Đắk Lắk, Gia Lai, and Đắk Nông and stakeholders in the coffee industry including NGOs, value chains, traders, and farmers. With an average age of 25-30 years, coffee trees in Việt Nam are entering the ageing stage probably resulting in 30-40 per cent decrease in yield. It is not only a challenge for coffee growers but also a concern for the coffee industry in Việt Nam. To resolve the problem, the seminar discussed trials, experiences and solutions to enrich coffee farmers’ knowledge and teach them innovative technical solutions to achieve successful replanting. Kohei Sakata, managing director of Bayer Vietnam, said: “Together we have continuously made efforts to contribute to sustainable agriculture aiming to provide people with healthy and affordable foods in the context of supplying food to a growing population, one of the most urgent challenges now. 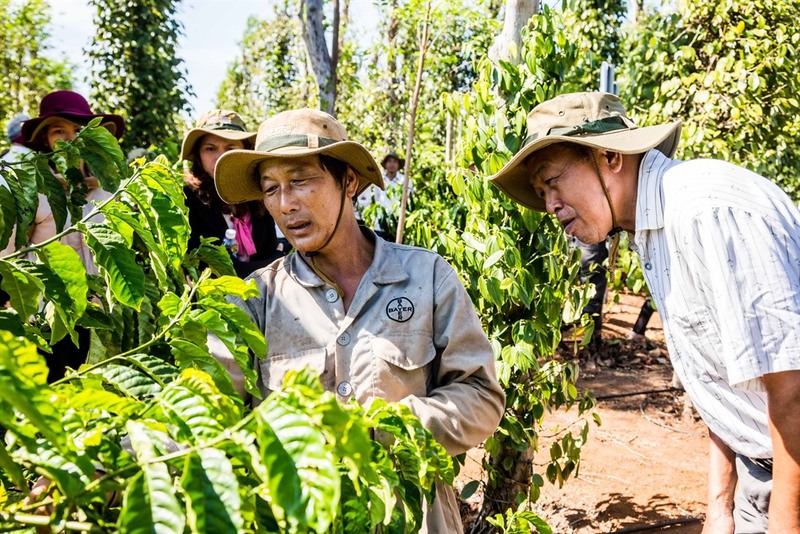 Phạm Công Trí of WASI hailed the successful methods trialled for coffee replanting. It is required to further promote and transfer advanced solutions to coffee farmers in highlands provinces, enabling them to carry out the replanting, according to Trí. One of the solutions delegates spoke about at the seminar was “drip protection”. It allows water and crop protection products to be distributed around fields through the drip irrigation system and delivered directly to the roots of the plants. The solution was highly appreciated since it could offer benefits to various stakeholders. For farmers, it improves incomes by reducing costs and helps manage risks for drip irrigation companies. As for the industry, this innovation is setting a new standard for further application and advancement. Food chain companies have clear benefits in the form of better quality, profitability and predictability with less residues and, importantly, traceability. On top of that, the solution brings about water use efficiency by strengthening farming practices which address the interests of local communities and the Government. Trí told the seminar that the trials of drip protection showed that the advanced scientific solution enabled coffee growers to replant successfully. “It is an ideal solution. Together with other solutions, drip protection and other products help address the major challenges in coffee replanting,” he said. In Việt Nam, drip protection trials for coffee replanting are being conducted by WASI using Bayer’s solutions including Much More Coffee and Velum and Netafim’s drip irrigation system. As a result, 100 per cent of coffee trees were successfully replanted.